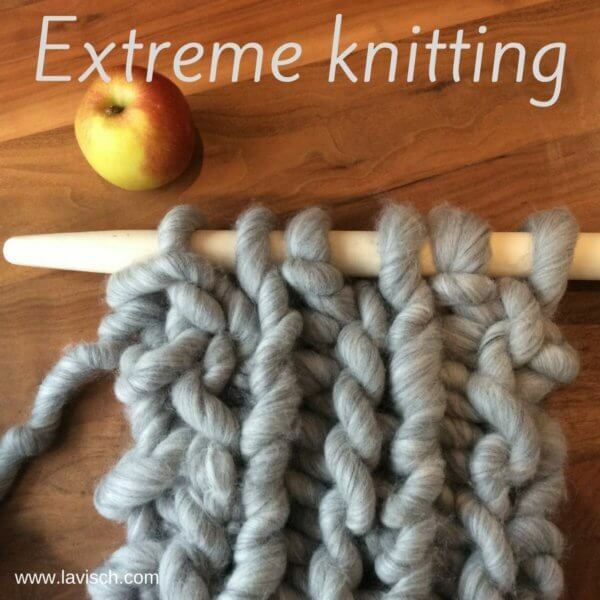 Let’s knit extreme! In earlier posts I already showed you how to make yourself huge broom stick knitting needles and also how I prepared my roving to be able to knit with it. And now it’s finally time to make the next step: I’m ready to go make a project with it! 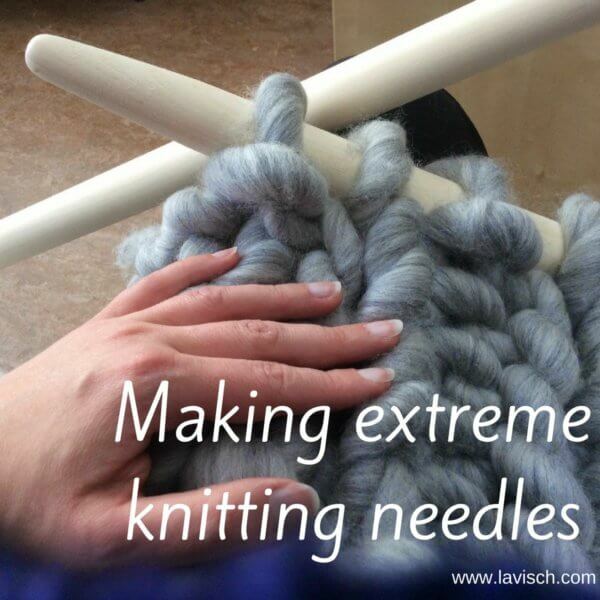 When knitting a pattern on such a large scale, there are several things that have to be taken into account. For example, it is often not possible to use a large stitch pattern where one repetition requires a large number of stitches and rows: unless you are making a blanket your piece is very likely just not big enough to knit one of multiple repeats of the pattern. In addition, the impact of extremely large stitches is on its own already very big. Adding a complex stitch pattern to that can be just too much for the eye. A simple stitch pattern with a limited number of stitches and rows is therefore my motto. Lace patterns are indeed very beautiful, but you have to remember you that if you knit with very thick yarn and big needles, the holes in your work will also be very large. This of course does not have be a problem, depending on the type of work you want to do. However, it is something you do need to take into account, because the effect with a tension of 20 stitches over 10 cm / 4 inch is very different from that with a tension of 2 stitches per 10 cm / 4 inch. Depending on the type of project, it can be desirable for the stitch pattern to be reversible. In other words, that your project will be pretty on both sides. For a long scarf or cowl I think that’s really nice to have, because both sides are often visible. That is why I have chosen a simple straight-purl stitch pattern for this cowl: A two by two rib pattern. 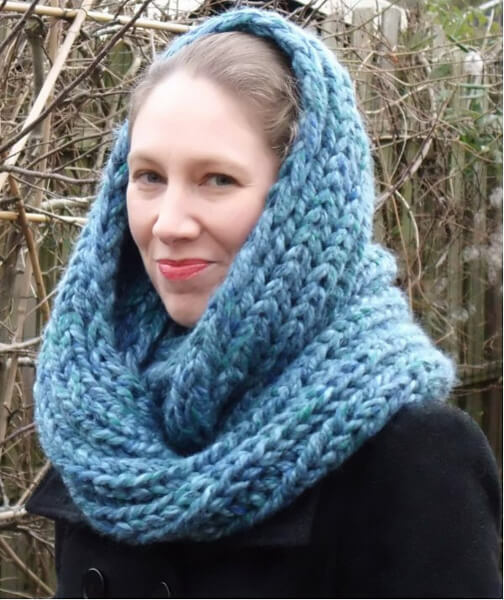 This simply huge cowl has been named after the giant Gymir, who was in Norse mythology the giant whose daughter, Gerðr, ultimately married the god Freyr. Cast on 8 stitches, I used the “knitting on” method. Row 1: *K2, p2; rep from * to the end of the row. Repeat row 1 until your yarn almost runs out, making sure to leave enough to bind off and connect both ends of the piece. “Sew” both edges of the piece together to form a loop by pulling the remaining yarn through the fabric of both edges by hand. Enjoy your GIANT result! And for comparisons sake, below my Gymir cowl in progress as well as another project on 5 mm needles.